St Petroc’s dates back to 1850 and the barns are completely renovated with many character features including new kitchen, slate floors, beamed ceilings and wood burner. 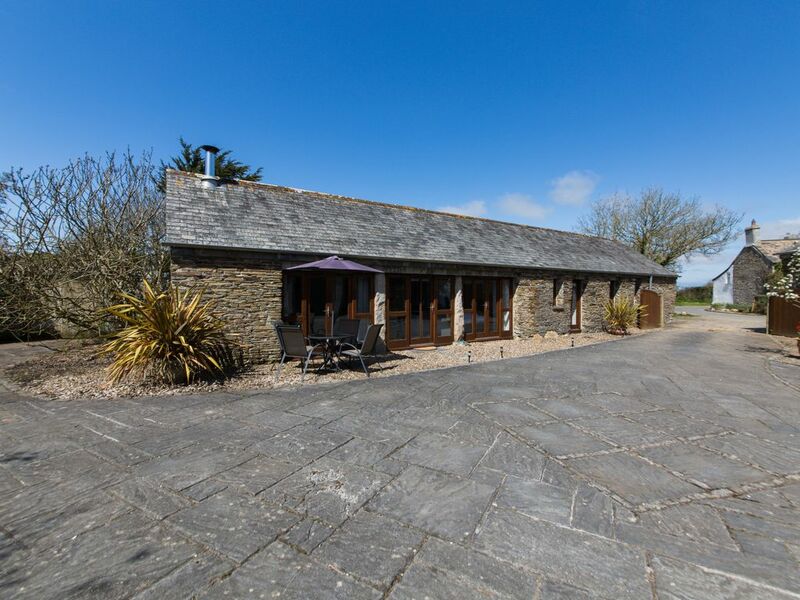 The barn is set in beautiful countryside in St Ervan which is near to Padstow and within an area commonly known as "Seven bays for Seven days" so lovely beaches to visit, all within a 5- 10 min drive. Great location for family holidays, visiting the many and varied attractions and of course for spending time just chilling. The Character Barn was renovated and converted in 2018 to a holiday let and has newly fitted kitchen with everything you could need for a perfect stay. The Barn is immaculate and has been thoughtfully decorated using nautical colours/soft furnishings and pictures enhancing the holiday experience. There is an open plan living room/kitchen/dinner with two very comfy Sofas, (one of which is a bed-sofa) Wood Burner, TV, DVD, Wi-fi, Blue-tooth speaker and DVD’s for your entertainment. The fitted Kitchen has all the latest mod cons including Dishwasher, Fridge, Freezer, and Electric Oven with hob, Washing Machine, Dishwasher and Microwave. The main bedroom is light, airy and bright with patio doors leading onto the courtyard patio. The King Size bed was well researched for comfortableness and there is plenty of storage in this room. The bed and all bedding is Hypoallergenic. In the 2nd bedroom is beach themed and there are quality bunk-beds with stairs that illuminate in the dark. The room is light airy and fun and has a large chest of drawers for storage. There is also a double bed sofa for extra guests in the Lounge and finally a separate family bathroom with Bath and Shower. The Barn is located just off the main courtyard at St Petroc’s. Our guests can access the property through the main gates which are closed at night. The barn has a patio area with table and chairs and there is also a separate natural pond garden dedicated to the barn guests to allow private relaxation. (Not suitable for toddlers) The barn has a dedicated car space in the Car Port. Our accommodation will allow escapism to a peaceful and relaxing haven with the benefit of having the beauty of the North Cornwall Coastline a few minutes in the car. We (Mary & Mark) are very friendly and welcoming. We have lots of local knowledge on places to visit, eat drink and see which are included in our guide book. We are in a separate building barn should you require support, help or advice. We fully appreciate and respect guest privacy. In terms of location we are ideally positioned just 3 miles from the North Cornish Coast and less than 10 min drive from Padstow with it fabulous restaurants (including Rick Steins) and with opportunities to Sail or visit the designer shops this harbor town has something to offer everyone. We are about the same distance from Newquay Airport. Mawgan Porth is 5 minutes in the car and is one of the UK Top ten beaches (listed by The Times) Porthcothan Bay, Treyarnon, Harlyn Bay and Trevone are all within 10 min drive. The fashionable market town of Wadebridge is some 8 miles to the East and Truro is approx. 20 miles away. Watergate Bay is no more than a 10 min drive an has a fantastic beach for relaxation and has world class surfing. We (Mary & Mark) will be delighted to welcome you to St Petroc’s Barns which date back to 1850. We are set in a secluded rural location just outside the Hamlet of St Ervan which is located on the outskirts of the village of Rumford. The location is quiet and peaceful and offers a sense freedom. We are fortunate to be a 10 min drive from Padstow (the foodie capital of Cornwall) with all its great restaurants and events throughout the year. We are within an area commonly known as "Seven bays for Seven days" so lovely beaches to visit all within a 10 min drive. Families tell us their kids love it because they are only in the car a short ride before reaching their chosen beach for the day. Families tell us they love it because at the end of the day it enables them to escape the noise and traffic of the coast however its so easy to reach their chose destination in Cornwall from our location. Families tell us they love like they have a "Home from Home" in the barn. Pond garden available with prior arrangement with owners. This is the perfect location for a get-away-from-it-all holiday for families or a couple. The barn is spotlessly clean and refurbished to a high standard. The barn is in a great location for Padstow and the Eden Project and the many beaches in the area. There are activities nearby for kids, stunning scenery and amazing restaurants close by. But equally it is good to stop in cook dinner and relax for the evening. The one issue I will mention is that the sofa bed wasn't the best to sleep on, very hard in the center and it felt that your head was lower than the rest of your body, but other than that it is a great place to stay. We really appreciate the time you have taken to review the barn and thank you very much for your feedback. We are really pleased you enjoyed your time relaxing and enjoying the barn and the nearby restaurants, beaches and activities. Thanks for the tip on the sofa bed, we will address this for the future. We have just returned home after a week at St Petrocs barn. We are a family of four and really enjoyed our stay. Our hosts Mark and Mary were very friendly and gave us some great tips for the surrounding area. The barn is cosy and very comfortable and fully equipped. The hosts have thought of everything, all finished to a very high standard. Comfy soft beds and pillows, fluffy towels, brand new kitchen, bright bathroom with great hot shower, wifi, board games and books to name just a few of the qualities. We had everything we needed and more all ideally located within driving distance of many local tourist attractions. Beautiful padstow was only a 15 min drive. We wouldn't hesitate to return to St Petrocs as it had everything to make our family holiday very special. Thank you again for your hospitality Mark and Mary. Thank you so much for taking the time to write a lovely review of St Petroc's its very much appreciated. We are very happy you all enjoyed your stay and you appreciated the little touches that made the difference like the bed, pillows and fluffy towels. You are a lovely family who explored the beaches and everything the area offered. We loved hosting you all and you are most welcome back at any time. We had a lovely stay in the barn. The location was nice and quiet and only a short drive from some great beaches. The barn was really nice, it was well maintained and very comfortable and we really enjoyed our stay there. Wonderful stay. Great accommodation inside and out. Owners were very welcoming. Mary and Mark greeted us on arrival with a warm welcome... and a lovely hamper of holiday treats. St Petroc's barn has a great open plan, airy living space that was perfect for us with our toddler. Bedrooms were a really good size with enough storage too. A lovely rural location easy to access so many places and the best beaches in the UK. The barn had a traditional Cornish feel with all the modern touches and everything we needed to have a great stay. Thank you ever so much and best wishes. It was great to host your lovely family Sarah, you were all perfect guests. We are glad you loved the barn and the open plan design. It was great that you explored the area and visited all the great beaches within a short drive of the barn. Thank you so much for the lovely flowers, it was fantastic to see that young William already appreciates the countryside including our chickens. Have a lovely rest of your Summer and we would love to see you return in the future. In terms of location we are ideally positioned just 3 miles from the North Cornish Coast and less than 10 min drive from Padstow with it fabulous restaurants (including Rick Steins) and with opportunities to Sail or visit the designer shops this harbour town has something to offer everyone. We are about the same distance from Newquay Airport. Mawgan Porth is 5 minutes in the car and is one of the UK Top ten beaches (listed by The Times) Porthcothan Bay, Treyarnon, Harlyn Bay and Trevone are all within 10 min drive. The fashionable market town of Wadebridge is some 8 miles to the East and Truro is approx. 20 miles away. Watergate Bay is no more than a 10 min drive and has a fantastic beach for relaxation as well as world class surfing.